Lately, not only in South Korea but internationally, exploring and knowing oneself has become a big issue. 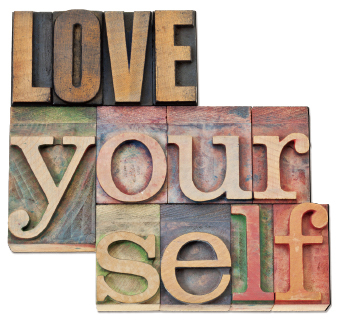 This is reflected in many types of cultural media such as movies, books and songs that have messages about self-esteem. I Feel Pretty, a movie released in June of this year, carries such messages of self-esteem. In the quote below, the man who loves the main character, Renee Bennett, explains the reason why he loves her. The reason he loves her shows effectively how people act differently according to their state of self-esteem. Also, by showing the self-esteem of Renee Bennett getting higher without any external changes, the movie tells people that self-esteem is not what it is seen by other people but rather how you feel about yourself. People with high self-esteem like Renee Bennett think of themselves as valuable people and behave confidently. However, the problem is that when people have low self-esteem, they cannot think and behave confidently like those who have high self-esteem. When people are in a state of low self-esteem, they may be so overwhelmed by their weaknesses that they lose the opportunity to find their strengths. Also, they will be easily influenced by others and keep comparing themselves with others, which makes it difficult to concentrate on themselves. If these symptoms get worse, they could develop into a serious illness such as depression, sleeping disorder, or panic disorder. However, in trying to come to terms not only with these symptoms but also with oneself, the state of high self-esteem in itself is difficult to attain. 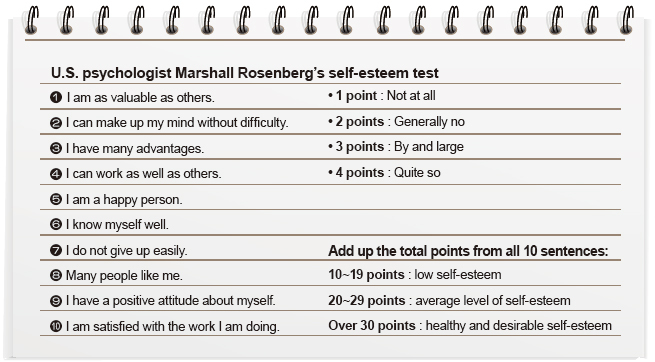 So, The UOS Times has prepared a simple test to identify your state of self-esteem more accurately. In the process of answering the questions, you may be able to find out whether you have low or high self-esteem by finding out your symptoms through thinking of the past. The results of the test may help you to think more deeply, get to know yourself a little better, and also serve as a guide for reading this article. How high is the self-esteem of UOS students’? To analyze the self-esteem of the University of Seoul (UOS) students, The UOS Times conducted a survey about their self-esteem according to gender and grade. This survey revealed some interesting details. First of all, most UOS students responded that their self-esteem is not that low. Among those surveyed, only a quarter of responded that they have low self-esteem. The survey also showed, a relationship of self-esteem levels to gender, with 53 percent of male students answering that they have high self-esteem, but only 41 percent of female students. Also, nearly 35 percent of female students responded they have low self-esteem in comparison to only 22 percent of male students. According to grade, the self-esteem of freshmen was lower than that of older students in that nearly 43 percent of them responded they have low self-esteem. Why Is There A Gender Discrepancy? When The UOS Times asked students which factor has the most influence on their self-esteem, students chose self-consciousness as the main reason regardless of their particular level of self-esteem. Based on this result, The UOS Times expected that female students have a more negative self-consciousness than male students. *A study of the science on nursing, written by Oh Eun-ju in 2014, supports this perspective in that male students show higher self-esteem than female students. She points out that the main cause of low self-esteem in female students is excessive narcissism. Narcissism is an exaggerated self-consciousness characterized by extreme self-absorption, making people want to draw the attention and compliments of others. * Oh Eun-ju, 「The Effects on Self-Esteem and Narcissistic Tendency to Depression in University Students」 June 2014. Why Do Freshmen Have Such Low Self-esteem? 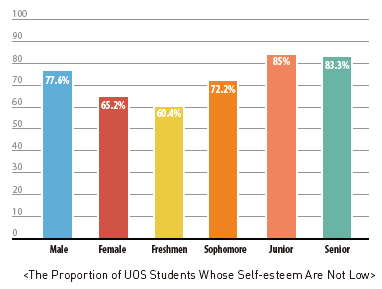 Our survey revealed that, the self-esteem of UOS freshmen is lower than any other grade. To investigate the reasons for this, The UOS Times interviewed Kim Sang-soo, from the UOS Student Counseling Center. Before explaining the reason why freshmen have such low self-esteem, Kim said that people must understand that Korean people do not have low self-esteem, but the social atmosphere encourages Korean people to think that they do. Turning to the self-esteem of UOS students, Kim noted that according to a report of mental health of graduates in 2017, freshmen showed not only relatively low self-esteem but also low self-efficacy against other grades, and self-efficacy is significantly relevant to self-esteem. He added that freshmen are inclined to feel confusion and uncertainty about their academic abilities about at university. Oh’s thesis supports this opinion, emphasizing that self-efficacy is a major component of self-esteem. Kim also remarked that some freshmen feel stressed because of their failure to be accepted by their first choice universities and because of the difficulty of adapting to their new environment. It is hard for students to deny the relationship between studying and self-esteem because most of them tend to think that credits and grades are strongly associated with employment and are thus immensely important. In survey, only 9.9 percent of students answered that self-esteem increases with advanced academic achievement. This means that most students with high self-esteem are more influenced by factors such as self-consciousness and human relationships, rather than by academic outcomes. Also, 18.9 percent of students replied that they lost self-esteem due to academic factors, followed by their self-consciousness. 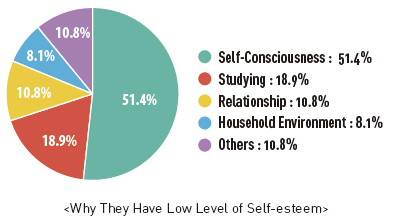 These results show that studying affects people with lower self-esteem more than those with high self-esteem. Most students have experienced stress from studying. So in college, it is easy to find that self-esteem falls due to poor academic performance. Counselor Kim said that many students come to the counseling center because of academic stress. For example, he told us that when seniors who retake a class wind up in the same class as freshmen, everyone wants an A but not everyone can get one. He said that it is natural that some students cannot get an A because the rate of A-level grades is fixed according to the relative grading policy. “It could be hard especially for new students because they are less familiar with study skills and preparing for exams than their seniors,” he continued. “However, some of them with low self-esteem are stressed without accepting these facts.” Since there are many good students at UOS, even if they cannot achieve first place, they can get good grades elsewhere. Employment preparation also has an influence on self-esteem. According to a survey conducted by Saraminhr, an employment webpage, in 2018, 50.4 percent of 456 job seekers indicated that they were not confident about getting a job. 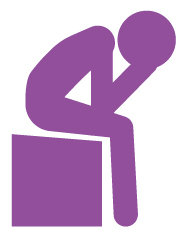 And the survey showed that the second hardest part of job preparation is low self-confidence and self-esteem. When looking for a job, people often criticize themselves for their failures and compare themselves with friends who have succeeded in gaining employment. If someone wants to be established, they should recognize themselves first. In sum, self-esteem can affect one’s study and can likewise be affected by it. People with high self-esteem can concentrate on their work and they can do it with confidence while those who do not have high self-esteem are afraid of making mistakes and worry about being blamed when they produce results. However, the situation is not always like this. * Research conducted by the psychologist R.F. Baumeister has shown that despite high self-esteem, students did not adapt well to school and showed aggressive behavior with low academic achievement. Therefore, it is important not to be obsessed with grades. * Baumeister, R.F., 「Low self-esteem does not cause aggression.」, APA Monitor, 1999. Human beings are social animals who cannot live alone and have to make relationships constantly. Thus, everyone develops conflicts about human relationships as they live their lives. For the question on our survey that addressed the factors affecting self-esteem, human relationships was the third most popular response. Many college students who have just started their new social lives and who come into interaction with various types of people find it difficult to form desirable human relationships. So lately, related information such as how to relieve the stress of human relationships or tips for social beginners continues to emerge. *In a study conducted by Jung Hyun-jin, two groups of students with high self-esteem showed more advanced interpersonal relationship abilities than those without high self-esteem. With healthy relationships, people can express themselves more clearly and broaden their understanding of each other. However, self-esteem can be damaged by the stress of human relationships. One student we interviewed, who chooses to stay anonymous, said that she cares a lot about her relationships with friends. She said, “I make friends widely and I am satisfied with my relationships. But once, I was lonely because I did not have any true friends to talk about personal issues with.” She wondered if her way of making friends was wrong and felt depressed about this. Thus, attempting to find the intrinsic cause of interpersonal problems can deteriorate the condition of self-esteem. Self-esteem is also important in love. Counselor Kim told us about a student who had difficulty in love because of his low self-esteem. The student wanted to talk to a girl he had just met for the first time. He knew how to behave but he could not do it, because he was afraid of being rejected. Nothing went well from the get-go for him. As shown by this case, people with low self-esteem do not realize that they are rejected not because they did something wrong but because they feel shy and awkward for the first meeting. An interesting study about this was conducted at the University of Manitoba in Canada that shows how self-esteem affects the way students approach members of the opposite gender. Sixty college students had a video call with an attractive person. The researchers told half of the students that if they liked each other they would actually get to meet, but told the other half that the two would only communicate through video and would never actually meet. For the first group, the higher the self-esteem, the more directly they expressed the interests. However, for the second group, the students with lower self-esteem expressed their feelings more actively. The researchers concluded that this is due to the possibility of rejection. In the first group, students could be rejected if the other people did not like them. However, there was no possibility of rejection in the second group, which shows that people can build relationships more comfortably if the fear of rejection is removed from their minds. * Kim Min-kyung, 「Relationship between Negative Emotions, Family Resilience, Self-Esteem and Suicide Ideation in University Students」, 『Korean Journal of Family Welfare』, March 2012. ** Lee Gyo-hyun, 「Mediating Effects of Self-Esteem on the Relationship between Parents’ Child Rearing Attitudes and Perfectionism」, November 2011. The UOS Times asked students how to improve their self-esteem. “Talk to friends or family” was the most popular response at 18 percent. Talking to loved ones is the easiest and simplest way for students to relieve stress and improve their self-esteem. 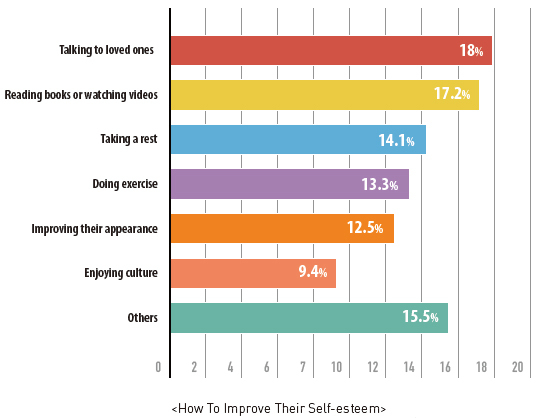 The second most frequent answer was “reading books or watching videos.” There are various media such as books, YouTube videos and lectures that can help to improve not only self-esteem but also happiness and quality of life. Exercising is also helpful for stimulating a healthier and more regular life. In addition, people can be satisfied with their image and gain confidence while improving their appearance. In addition to these, students can increase their self-esteem by enjoying culture, religious beliefs, engaging in self-examination, and other such pursuits. 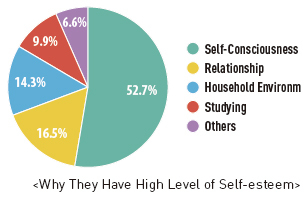 Through our survey, interviews and research, The UOS Times has discovered that self-esteem differs according to various factors such as gender, university year, household environment, grade point average (GPA) employment search status, social media, human relationships and love. Analyzing the survey on self-esteem of UOS students, The UOS Times found that the results from the survey were differed little from what people might normally expect. For example, freshmen have lower self-esteem than seniors because of the difficulty of adapting to the new atmosphere of university, which is different from high school and confronts students with the challenges of studying the right way, making new friends and finding the right lifestyle for themselves. In addition, the fact that UOS students generally have high self-esteem was one of the phenomena that differed from what we expected. However, even students who have high-esteem can be affected negatively by small factors. Thus, in order to raise self-esteem, Counselor Kim Sang-soo advises UOS students to visit UOS Counseling Center, which is always open for the comfort and convenience of students in need of counseling of any kind. He also recommended reading. He said that not only reading books that directly discuss self-esteem could help, but also learning through various experiences helps too. He added that novels could help as well, as they provide indirect experiences for the reader. Other than these tips, there are many ways to improve self-esteem on your own. For example, writing a diary every day, speaking to yourself in the mirror, or writing little notes to praise yourself could help to increase your self-esteem. It is important to increase your self-esteem with the methods mentioned above and to maintain it but it is also important not to damage the self-esteem of yourself or others. Blaming yourself, underestimating yourself, or even hating yourself can unintentionally damage your self-esteem. In order not to lower self-esteem of other people, you must also maintain deep consideration toward the person you are talking to. This is very hard since most of the sentences in a conversation take up less than a second. In order not to lower other people’s self-esteem, it is important to be considerate of others, to think before you speak, and to keep your conversation clear. The UOS Times hopes that all of us here at UOS can help raise self-esteem of each other through the consideration and treatment of others.